This woodcut with its expressively painted figures can not be attributed with certainty to one of Harunobu’s students and successors. 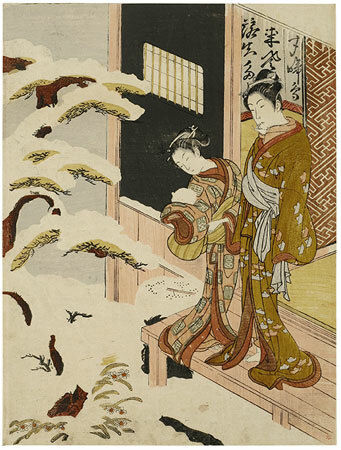 The faces of the beauties and their kamuro reflect neither Harunobu’s style nor that of his closest students. Notable in this print are the extensive white spaces, which are emphasized by strongly embossed contours and uncontoured printing. The face of the courtesan and her kamuro are unlike Harunobu, but neither do they closely resemble the work of any of his recorded pupils. The extensive areas of white boldly outline in gauffrage are also quite remarkable and unlike the usual delicate patterning for which embossing was usually used in this period. Regardless of its attribution, or the lack of one, the print possesses great charm. The screen inside the room is inscribed with part of a Chinese poem. The kamuro’s dress is patterned with characters in seal script, a few of which are legible, but do not convey a date or meaning, unless the two closest to her hand are meant to be read Tomita, a publisher active in this period.